Each custom necklace is made up of beautiful glass beads and metal spacers on either side of your choice of bird, and hangs on your choice of either a waxed cotton, or leather cord. Parrot size depends on species, and cord length will be made to your chosen length, with an optional 3" extender to make it adjustable. 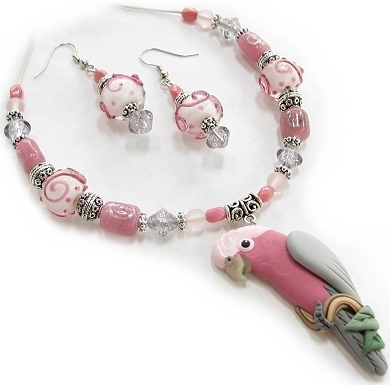 Matching glass bead dangle earrings are also included in the straight design shown here or a larger chandelier style. A variety of seasonal jewelry, and other unique themes are also available which are not listed in detail here. See Special Designs Page for details. 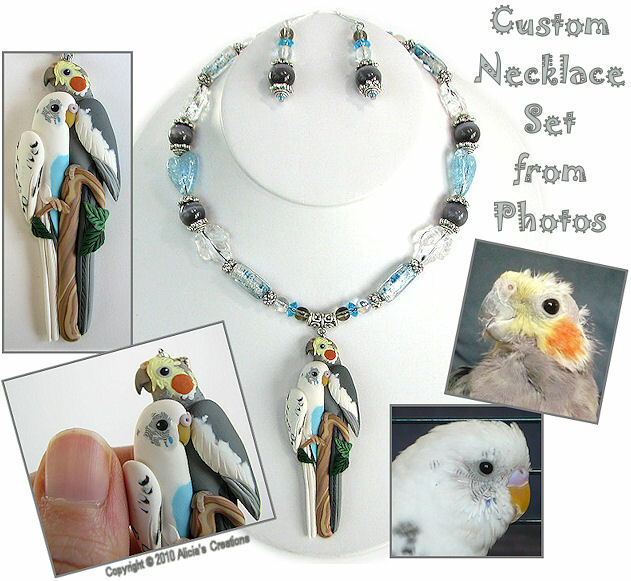 Non-custom necklace sets are lower priced, and to see what is currently in stock, please see the inventory page. 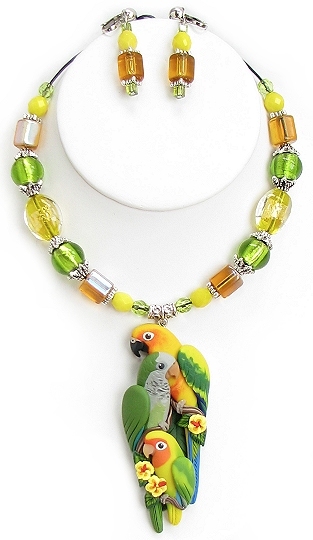 The glass beads are handpicked to match each bird's particular colors or colors of your choice. Various other quality beads are sometimes used as well, including Bali styled silver, handmade wooden beads, and semi-precious stones. Exact bead style, size and color will vary, each necklace is one of a kind and unique! 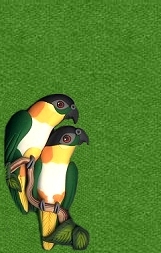 Please scroll down to see more photos or PAGE TWO , PAGE THREE, and PAGE FOUR to view more examples of the bead color and species variations. 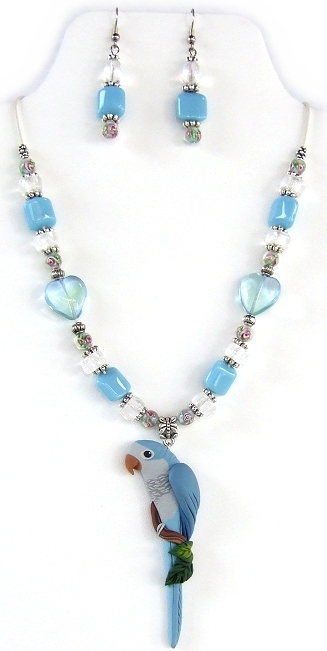 Full bodied bird, strung on leather with beautiful glass beads in your choice of color scheme. Matching beaded dangle earrings on surgical steel or sterling silver ear wires. 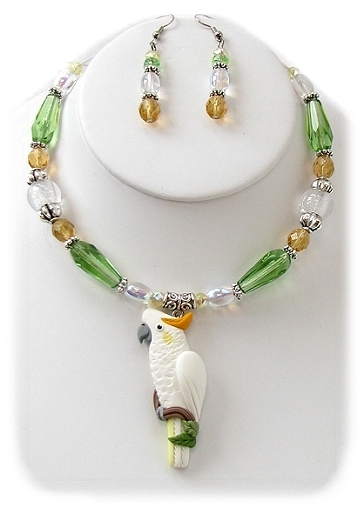 Two full bodied birds, nestled together, strung on leather with beautiful glass beads in your choice of color scheme. Matching beaded dangle earrings on surgical steel or sterling silver ear wires. 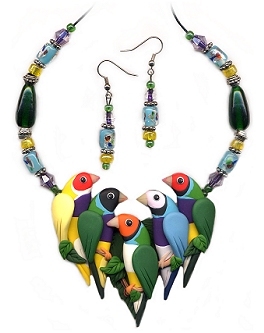 Three full bodied birds, nestled together, strung on leather with beautiful glass beads in your choice of color scheme. Matching beaded dangle earrings on surgical steel or sterling silver ear wires. Email for details, stating all species desired, for options and prices. 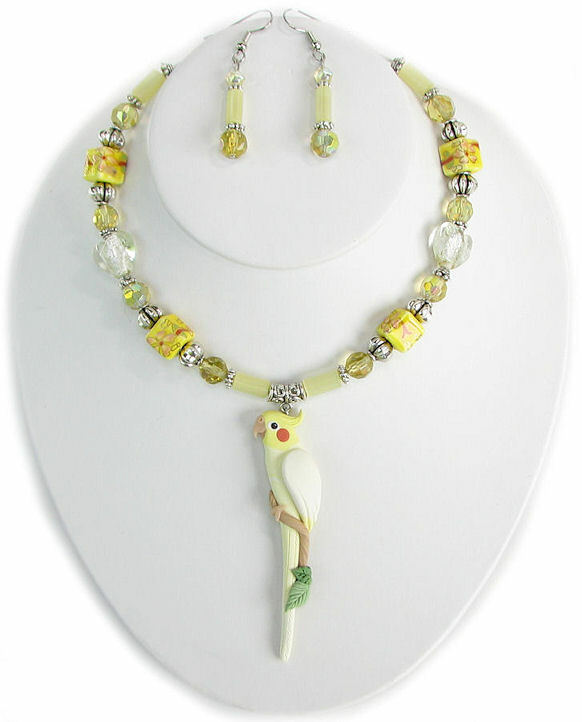 Huge variety of seasonal themes can be made into necklace sets, see Special Designs Page. 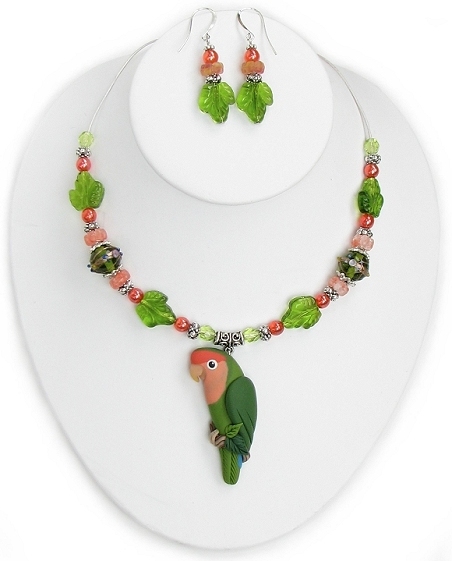 To view parrot jewelry that is available for immediate purchase (NON-custom), please see the CREATIONS IN STOCK Inventory page.